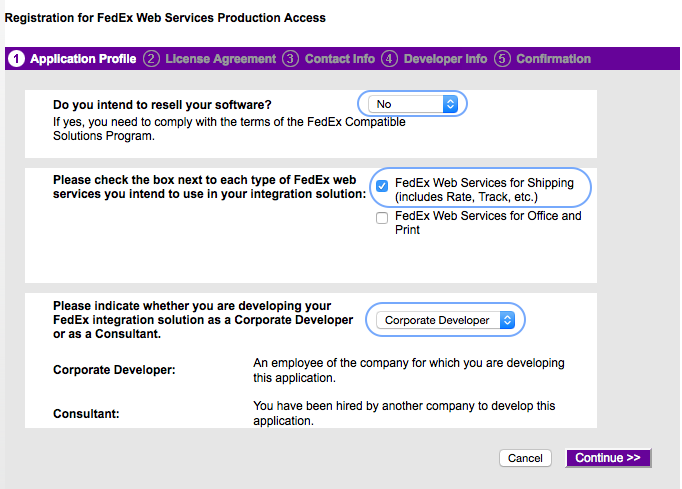 Register for a FedEx developer account if you do not already have one. Login to your FedEx online account. Complete the form and make sure you select Global and US , then accept the agreement to continue. If you're testing intra-country within European countries, select the right country in addtion to a US and Global account number. Note down the Developer Test Key, Account Number, and Meter Number. Complete the forms, then accept the agreement to continue. Note down the Production Key and Meter Number displayed.